as we've discussed, "The Japanese government let Perry come ashore to avoid a naval bombardment. Perry landed at Kurihama (in modern-day Yokosuka) on July 14, 1853 presented the letter to delegates present, and left for the Chinese coast, promising to return for a reply. by at least 1861, the flood of western visitors seemed unavoidable (great website about all of this). japanese artists portrayed what they saw through the filters of their own culture and art. a few of the western visitors, painters, were powerfully drawn to what they saw not only as beautiful but also as as a counteractive to the industrial revolution; they decided to stay. these western artists portrayed what they saw through the filters of their own culture and art. these were the early 1860s, the years of the very beginning, in france, of impressionism (a part of japonisme). the impressionists had to show independently because the academy felt they did not quality to be shown as fine art. their work just wasn't as classic, even as photo- graphic, as it had been during the victorian age, even the pre-raphaelite period, and as they felt it must be to be "fine art." so it was still this academic style that these painters were bringing with them when they landed in japan, and with which they continued to display their new loves: the land and the people of japan. 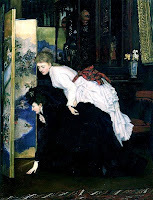 had they stayed in the west, they might still have continued to paint this way as did whistler and tissot, and others, many of whom began featuring japanese items in their work. 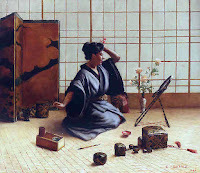 the painters in japan included robert blum, frank dillon, armand lachaise, charles wirgman, and more. 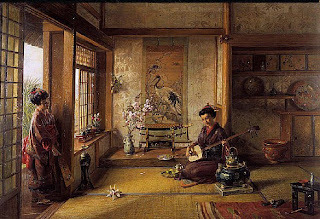 in the victorian academic style of painting their contemporaries who'd stayed in the west, painted the shops, and the people, and the daily lives in japan. next: we'll begin to watch as the intermingling really began. we've already looked some at how the west began to incorporate much of the style of the japanese artwork up to this time. now we'll also look at what started happening with the japanese artists, and learn a little more about the westerners who stayed. I find this to be quite fascinating. I had for the longest while as my screen saver, a gorgeous woodcut print. It depicted in the background, the baths, kimono clad ladies drifting to and from - the main setting an open porch revealing the street scene - red tile pagoda roofs rising above the landscape. But what also intrigued me the most was the foreground: two Englishmen dressed in silk robes, playing cards at a square table whilst being served tea .... down to their rounded spectacles and waxed mustaches ..... incongruous. I have searched vainly on the net for that particular image. I have no idea why I did not save it ... but such as things go. I wanted to share the artist's name with you. i'm really glad to be learning all this context stuff and sharing it, and that it clicked for someone. oh yeah--i noticed i'd done that this morning and changed them when i first woke up. my only excuse is that i was really tired last night. i did know the correct name--i did all my searches by the correct name... so i didn't screw up till the end! 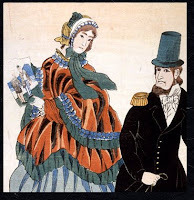 and yes, i noticed that too -- a number of people seem to be doing 'restrikes' of those two; having seen a lot of georges barbier before, i'd say they don't look very good. thanks for commenting evan!, and for your kind words.